Body-Solid are the leading makers and providers of high quality fitness equipment to be used at home and gym. Having an experience of over 20 years, Body-Solid con sistsan of wide range of products in the fitness industry which normally consist of weight machines, cardiovascular machine, weight plates, kettle bells, dumbbells, barbells and many fitness accessories. Building a body like a top level athlete requires a lot of hard work, motivation, determination and focus. Though having all these things and a good set of Iron weight plates will enhance your goal to move a further step. Free weigh training gives a vast variety of intense exercises for a wide range of user. Starting from beginner to top level athlete, they gives an equal result. Nowadays, fitness equipment is selected by customers through its affordability, durability and functionality. As the competition is very much increased in today’s market, the chance of being a fool after choosing an equipment are very more. Weight plates are considered an essential way to workout, while the barbells are also given an equal importance. 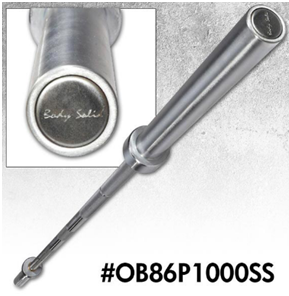 So for that, Body Solid Olympic power bar comes in a list of one of the best barbells available in the market. With high quality, affordability and durability, the Body’s Solid Olympic power bar consists of extensive features and benefits, that aren’t to be compromised. 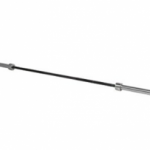 Having a weight of only 20 kg, the barbell has the capability to withstand up to 1000 pounds at a time. The bar consists ofa reliable spin due to brass bushings. 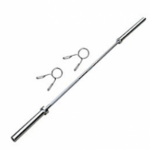 The length of the barbell is 7 feet, while the diameter of shaft is kept very standard and is 30mm. The best identification of this barbell is having a steel end cap with a body solid logo on it. The Body Solid Olympic Power Bar lets you to enjoy a wide range of superior quality of workouts. The barbell is designed in such a way to withstand heavier workloads of workouts starting from easy to hard, to help you come up with best possible workout routine. The bar is constructed in such a way to ensure you high quality equipment of a power bar which can be used anywhere, home, commercial gym, apartment gyms and more. The bar have a weight of 20 kg and have the ability to withstand weight up to 1000 pounds. It might me be very surprising for you that how can a barbell can withstand that much of weight, while having a pretty low weight. 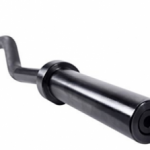 The answer is because of its high quality construction and great testing which made this barbell pretty heavy duty. The construction of the bar is done through solid chrome which is considered one of the best, yet an affordable material than stainless steel. Chrome bars are very much recommended due to the fact that chrome shows greater longevity by preventing the bar from rust and corrosion. The oxidation rate of Chrome bars is very less, making them desirable to use in humid regions. Chrome lets the plate easily and smoothly slide on and off from the shaft without producing any scratches or chipping. One downside of chrome is that it’s needed to be handled with care by properly re-racking and preferable to use them on floor padding. The Body Solid gives you the variety to choose your respective barbell in 5, 6 or 7 feet length which fits standards and skills of every person. 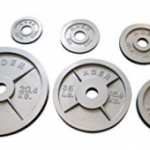 The dimensions of this body solid barbell are kept very standard so that it fits every Olympic weight set quite comfortably and let you purchase standard weight plates easily. The diameter of shaft is 30 mm while the diameter of the sleeves are 50 mm. Sleeves are designed to be very heavy duty and consist of brass bushings. The brass bushings help the barbell to have a proper spin of collars while doing exercises such as curls, bench press and deadlift. Though, for spin needle, bearings are considered more because of theirprecision, but brass bushings aren’t really bad, the spin of the collar in bushings are quite less but that factor isn’t really to be considered if you are purchasing a low priced barbell. The knurling done on the bar is on a moderate level which makes the handling of bar secure and comfortable. The dual knurling on the barbell helps you properly adjust your hand while the knurl marks are with respect to IWF standards. Professional weight lifters might not be really satisfied from the knurl grip, as they choose a knurl which is quite aggressive. Though, grip and knurl varies according to people’s skills and capability. 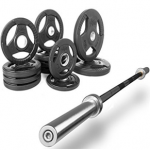 Whatsoever the material of the barbell is, it is always recommended to maintain and properly clean the barbell in order to increase its life span and maintaining its looks. So, a light coat of WD-40 and three in oil will might do your job. The weight of the bar is 20 kg. The barbell hasaweight capacity of 1000 pounds. The construction of the barbell is done through hard chrome. The bar consists of brass bushings to provide a proper spin. 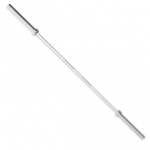 The dimensions of the barbell are kept very standard, having a 30mm shaft diameter with 50mm sleeves. The bar consists of dual knurl marks with respect to IWF standards. Center knurling is also provided. The length of the bar is 7 feet. The length of the sleeves is 15.25 inches. The originality of the barbell is shown through the steel end cap which has a body solid logo on it. Comes with a two year limited warranty. 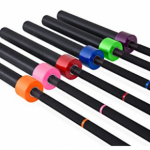 In my opinion, the Body Solid Olympic Power Bar is a very affordable and high quality piece of equipment that has the capability to fulfill your basic barbell requirement. Being a beginner I purchased the Body Solid Olympic Power Bar because of its affordability and extensive features. The first impression of this barbell was very bad as it came in bad packaging and wasn’t shipped within the required time. But after opening the packages, I found that the barbell is in a good shape with no scratches and damages done. When I started working out with this barbell, I experienced that it had a good feel and comfortability because of those dual knurl marks. While the brass bushings worked extremely well in medium weight by giving a proper spin. The spin was essentially reduced as the weight was increased. The chrome coating gave a very eye warming and durable look. Though, even in chrome the bar looked very heavy duty that can handle wear and tear. Overall a very decent purchase and I fully recommend to beginners and intermediate weight lifters out there. 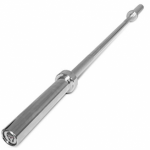 Construction of the barbell is very durable due to hard chrome coating. Chrome prevents the barbell from rust and works perfectly well in humid regions. The knurling on the barbell is very moderate that let you easily grip and adjust your hands on the shaft. With standard sleeve dimension, choosing an Olympic weight set is very easy. The barbell doesn’t come in a good packaging. Construction of the barbell isn’t done in USA. Professional weight lifters might not prefer that moderate knurl. Lifetime warranty should have been included.